I went looking for a Celtic Knot, but this is what I found. I don’t know what to call it. Finished with YG and CA. And now, because I’ve nothing else to say, you’ll indulge me a little piffle. This is a tree. 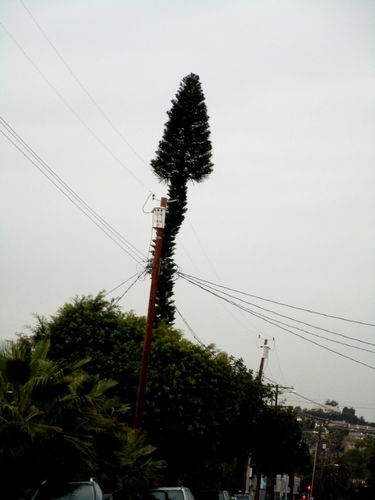 A real tree. A Carolina Pine, On Coronado St., South of Sunset. The power pole with the transformer is well away from the tree. 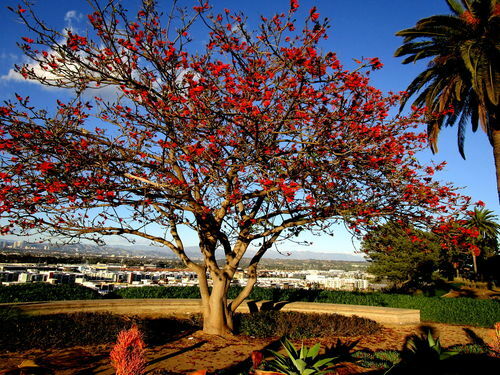 A couple weeks ago, I was up on the bluff at Loyola Marymount University, on an incredibly clear day, when this tree demanded that I photograph it. A very classy pen – that one should be easy to sell. And very interesting trees what is the variety of the second tree? Hard to tell if those are red flowers or red fruits (or red leaves). I took a break from the pens but wife keeps giving them away so may have to turn a few more, maybe a new style? Knice Knot on that pen, Mark! We don’t see too many clear days like that any more. But if I may be a devil’s advocate… pity it’s ”wasted” on a slimline! But if I may be a devil s advocate… pity it s ”wasted” on a slimline! waste not want not duckie! slim or not it’s a celtic not! so buddy you say you have else to say,but do tell, what is the wood and what creates the knot? and as the duck said,i forgive you for the slimline-lol. The touch of an artist. Andre: #8 is Claro Walnut. LBD: A pen with all the sexiness of a clothes pole needs some embellishments. Hey Mark, so it’s not a knot, or at least a Celtic Knot, but then again it is a Knotty not. What more is there to say. lol. I like it. You shoulda seen my first not. Honorable Bob: While this is my first pen with a knot, it is not my first knot. As you can see, I knew how to do it right, at one time. Larry: The wood is a species called “I Don’t Know,” and the “knot” that’s not really a knot is pop can aluminum inserted with CA into gent saw kerfs. I think, next time, I’ll just go ahead’n use the sandwich method. This was an incredible an=mount of work, for something no one wants, so far. (I made three sales pitches with it today – no sale. Very Nice Project & Well Done Chris! Larry: The wood is a species called “I Don t Know,” and the “knot” that s not really a knot is pop can aluminum inserted with CA into gent saw kerfs. I think, next time, I ll just go ahead n use the sandwich method. This was an incredible an=mount of work, for something no one wants, so far. (I made three sales pitches with it today – no sale. hey what ever it is it’s gorgeous,love it buddy.and ya know there’s nothing wrong with an occasional slimline,woman especially don’t care for the fatter pens so if you want to sell em ya gotta have some in the mix.nice work as usual.